We recently received a welcome update from our former minister Graham McGeoch, his wife Telma and son Lucas telling us of their life since moving to Brazil. We decided to return to Brazil and are living in Vitória, the state capital of Espírito Santo. If we translate Vitória, Espírito Santo we will learn that the city is Victory in the Holy Spirit – named to commemorate the conquering, and thereby massacre, of the indigenous peoples in 1551. Vitória is just north of Rio de Janeiro on the Atlantic coast. 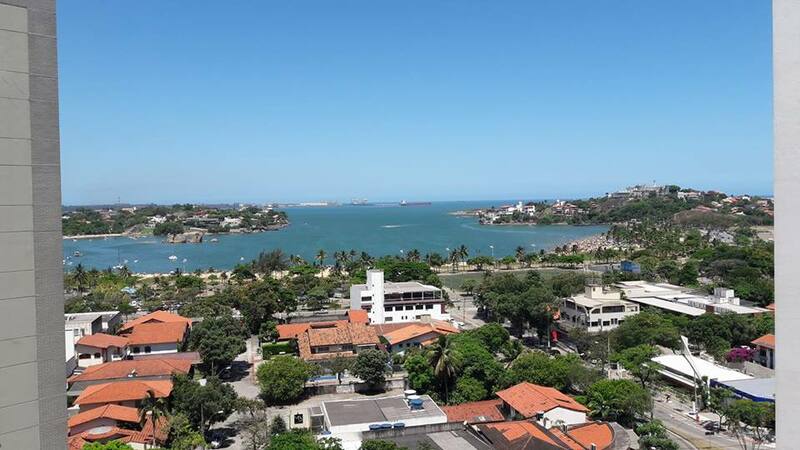 We have a comfortable apartment at the beach of Santa Helena in Vitória, and our street is lined with trees which offer shade and cooler temperatures in the tropical heat. We were able to return to Brazil, and to move to Vitória, because the Faculdade Unida de Vitória invited Graham to join its staff team teaching theology. Faculdade Unida de Vitória is a pioneer. It is already amongst the largest theological faculties in Brazil offering undergraduate and post-graduate degrees in Theology and Religious Studies. It has partnership agreements with Princeton and Hamburg universities. There are over 1000 students on its study programmes. Graham is responsible for teaching systematic theology, and ecumenism and inter-religious dialogue. During his time in Brazil, he has been researching about Islam in Brazil discovering that it has been present (although hidden) in Brazil since colonial times. Telma loves being back in Brazil. In addition to visiting family in Bahia and São Paulo, she has found a job in Vitória. She teaches English in a bilingual school and a playschool. Both are located within walking distance of our apartment. Telma’s English-language work with toddlers and young children has brought special recognition for the schools. She has also put to good use her ‘development studies’ background and has been involved in consulting an international NGO about a UN-funded project for Venezuelan refugees in Brazil’s Amazon region. We are hopeful that further opportunities like this will appear in time. Little Lucas is thriving. He loves the beach – the sandcastles and the sea. He is learning to play football – a future number 9 for Scotland. (Scotland needs him more than Brazil does). He goes to creche/pre-school every day and has made a lot of friends. The school is situated in a favela – a shanty town – on a steep hillside. We are finding our way in our new environment. Telma is involved with the Women`s Forum in the State. She is helping with workshops about women’s rights, important in a State that has the highest index for femicide for black women in Brazil, and the second highest index for all women in Brazil. Graham is supporting the work of CEBI – a grassroots Bible study network that has pioneered new ways of reading the Bible in poor communities across the continent. It is based on the work of Ernesto Cardenal in Nicaragua and Paulo Freire in Brazil. While it has been a good time as a family to return to Brazil, it is a politically uncertain time. There will be a presidential election later this year. In Rio de Janeiro, the military are already deployed on the streets in a low intensity civil war. The presidential election is extremely polarised and some cast doubt on its viability. It serves as a reminder that democracy – and its ideal – is young in Brazil, and it is a country with vast inequality and potentially explosive socio-economic challenges. Some are calling for a return to dictatorship. We are unsure what the future holds for Brazil. However, we are enjoying our Brazilian adventure, and we are safe.